Lightning & Thunder is a complete 12-week program for athletes and soon-to-be athletes that includes both a beginner and intermediate strength program, beginner and intermediate speed and agility (SAQ) program, a written exercise glossary, a video exercise library, and an educational manual to help you understand the how and why of athletic training. Whether you’re a field- or court-sport athlete looking for that extra edge or a recreational exerciser wanting to move better and faster, you won’t find a more comprehensive or effective athletic training resource anywhere. “There’s just nothing like the feeling of being fast,” says my good friend Angie Brambley-Moyer, a longtime Division-1 collegiate strength coach and director of strength & conditioning at Princeton. She’s absolutely right. Being able to move exactly how you picture yourself moving in just a fraction of a second is a strangely powerful and liberating experience. If you’ve been fast before, you already know what I mean. If you’ve never been fast before (yet! ), it’s hard to describe, but I’ll try: It’s an unrivaled feeling of completely taking up residence in your body, using all of its abilities, of truly reaching your physical potential. It’s a feeling of fully embodied freedom. I’m not just talking about linear speed here. When I played rugby for the U.S. women’s national team, it was part of the job duties to also be nimble and quick from side to side, too — to be able to turn and stop on a dime, as well as switch on the afterburners and jet straight ahead. It was an absolute blast to be able to move rapidly in any direction. Lightning & Thunder came to be because... well, because in the seven years since I retired from the sport, I’d lost a step. OK, OK... I’d lost a lot of steps. My movements had become sloppy and inefficient, and I didn’t have control outside of very specific positions. Efficiency of movement is what makes athletes look smooth, controlled, and athletic — the ones who stop you short in your tracks with their fluidity and grace. Very good athletes waste no energy, even while they’re working at high intensities and over a long period of time. In recent years, I’d gotten into the grind of slow, heavy powerlifting, and the specificity of that type of training, along with the creep of the years and the body’s “use it or lose it” motto, meant my overall, multi-planar athleticism was in decline. I missed feeling athletic in almost any situation. I missed it lot. So, I told my friends Angie Brambley-Moyer and Tim Moyer, both world-class strength-and-sport coaches, that I wanted to get it back. That I wanted to get it allllll back. I ALSO told them that I wanted to invite others who were in the same boat — former athletes, not-yet athletes, or current athletes who wanted to level up their game — to join me in my quest. And, IF you’re in good hands, it’s a safe and progressive process. I can’t rave enough about Team Moyer’s talent. Neither can anyone else, as you can plainly see above. They are the people you want to have access to when you’re looking to improve athleticism. Together, Tim and Angie have nearly 40 years of experience training field and court-sport athletes in a wide range of endeavors at levels that range from youth sport players to rec leaguers to collegiate athletes to Olympians, and they really brought the heat with the program they put together here. It includes all of the world-class approaches they use to ready their athletes and athletes-to-be for sport. A sport. Any sport. Make no mistake about it, though: Just because the training isn’t geared toward a specific strength sport does NOT mean you won’t get strong. You will. In fact, you’ll get strong, springy, agile, fast, and quick (because fast and quick are two different things). You’re going be able to juke defenders and zig-zag your way down a court or field, shifting directions accurately and easily. You’ll see increases in your vertical jump, and probably notice differences in your general “freshness” factor, too. Even your posture will improve (you will not believe how critical this is to sports performance). You’re going to be ready to play. And then play again. As longtime strength and sport coaches for all levels of athletes (including future athletes! ), Tim and Angie know how to teach people how to move more efficiently. Every single one of the components in the program is geared to optimize performance while decreasing your likelihood of injury. There’s zero fluff involved. Every single movement is carefully thought out, and serves the goal of making you into a lean, mean, athletic machine, and in a time-efficient manner — this type of training takes less time than your average strength-training program. The 12-week program is called Lightning & Thunder because frankly, you’re gonna become as fast as lightning and as powerful as thunder. In other words, you'll become a force of nature. The very best methods for developing absolute strength, strength-speed, speed-strength, and absolute speed (and why you need to develop ALL of them for maximum athleticism). How to control your body and the forces you apply to it (in the form of weight or velocity) for better efficiency of movement — the key to injury prevention and performance gains. Proper starting techniques (forward, backward, side, and angled versions that implement crossover and drop-step techniques). Proper stopping techniques from all different angles (forward, sideways, backward, and forward and backward angles) — this type of eccentric strength is HUGE for injury prevention. Progressive acceleration techniques that create more speed and instill in you the ability to change gears quickly over very short distances. The optimal approach to max speed work (variations of progressive acceleration over longer distances — 10 to 50 yards). Progressive agility drills (which you won’t see in any other program) designed to teach you to safely transfer force in all directions from a number of positions. How to decrease coupling time between stop-and-start movements. These quick transitions are one of the biggest factors of athleticism, and they have everything to do with your level and type of strength. The most effective ways to get strong in a number of different positions and directions so you can adapt to a multitude of athletic scenarios. How to properly build muscular endurance in the weight room. Progressive, cutting-edge techniques for incorporating plyometics into your program to best leverage the stretch reflex, so that you become faster and springier. How to build aerobic and anaerobic capacity in conditioning sessions. What we’ve created is an exceptionally detailed, easy-to-follow, all-encompassing training program that can take you from whatever your starting point is right now and hand-deliver you to the outer edges of your physical potential — fulfilling that potential possibly for the first time ever! For those who prefer visual cues, the 24 videos of strength exercises and SAQ drills will break down step by step everything you need to know to be able to do or coach the movements. An intellectual deep dive into the principles at play when developing better speed, strength, agility, and conditioning. Learn how various qualities of strength and different strength zones both bolster one another and support different qualities and zones of speed and agility work. A carefully crafted 12-week program that includes lessons on proper sprint-start technique (including forward, backward, and side and side-angled versions), progressive acceleration techniques, max speed work, proper stopping and force absorption from all angles, faster transitions, and muscular endurance strategies. Includes the same strategies for performance enhancement as the Beginner SAQ Program, but further ups the ante. Rather than one SAQ day per week, the Intermediate has two. It also incorporates more anaerobic conditioning (vs. aerobic conditioning). A complete 12-week program that focuses on building highly useful strength, including how to use eccentrics and isometrics properly, maximizing your use of the force velocity curve while also learning to absorb and create force in the weight room and improving muscular endurance. Specific metabolic and postural circuits to finish each session. Also includes four different warm-up routines that build full-body mobility. Takes the same scientifically sound principles of the Beginner plan, but tailors them to those with more advanced levels of fitness. The Intermediate program includes more absolute speed work with plyometrics, and while both programs incorporate eccentrics, the Intermediate program’s are faster due to load and rep scheme. This creates higher levels of hypertrophy work. To put this package into perspective, its components would and should cost you nearly a grand (and many more thousands of dollars went into the combined 40 years of education and experience this program comes with!). But for a short period of time, we are slashing the price to a frankly preposterous extent. So that’s our guarantee. What I’m asking you to guarantee us is that — IF you’re ready to take the (very literal!) leap — you grab the program during this very short time it’s available for half off, and then you give it a genuine go. The alternative is that you keep doing what you’re doing now, and be left wondering what you’re really capable of. If you’re truly ready to find out, though, simply click the button below and let’s get moving... fast. The prescription was repetitive enough where I could master each component, but varied enough to where it kept me entertained. I also felt that the general athletic components in the program complemented my weightlifting training very well. I’m looking forward to the next 12-week cycle! This program has improved my explosiveness off of the line and made my change of direction quick and efficient. My form changed significantly within the first few weeks of starting the program. Beyond that, my posture has improved and my lower half (ahem, backside!) has become sturdier/more substantial/solid/all of the above. If I had one thing to say about the Lightning & Thunder program it would be: Holy Booty, Batman! Seriously, this program was rockin' my derriere. I'm loving the programming and exercise selection. The pause reps and eccentric tempos have been a welcomed challenge and are greatly underestimated. Some things have been new to me and others are things I haven't done since I played organized sports as a kid and teen, which has been awesome! It's been really fun to switch things up and get to play around with a new programming style. Loving it! I’ve never really lifted or worked out before. Is this program for me? It definitely can be. This information is meant to be studied, implemented and mastered by anyone wants to run, jump, and move better. If you purchase Lightning & Thunder (L&T), you will automatically receive TWO training programs: one labeled Beginner and one as Intermediate. Start with the Beginner program, and follow the cues and instructions diligently for best results. You’ll also gain access to our detailed Exercise Video Library and Exercise Glossary, which will walk you through each movement so that you learn to do them properly. Even if you’ve rarely (or never!) stepped foot in a gym or onto a field or court, you can still get comfortable with the material with the information provided. That being said, if you’re already an athlete or fitness enthusiast, L&T is perfect for you, as well. Everyone’s starting point, working weights, and abilities are different, and the program allows for that. Having the Intermediate program as an option is useful for more advanced athletes, but the Beginner program can be a nice start for nearly anyone to build a deep, wide base level of athleticism. Is this program REALLY different from other strength or speed-and-agility programs? Absolutely. There is no comparing this to anything else because there is nothing else like it to compare to. There’s no other program that offers such a comprehensive resource for field or court athletes (or anyone who wants the skills, speed, and look of one). The highly detailed video tutorials, along with the crystal-clear photographic and written descriptions of every exercise in the program, mean that you will be completely equipped to navigate the program with all the information you need. By balancing the strength and SAQ work, your training sessions feel like sport practice or sport play, especially if you do this program with a friend or your teammates. If you’re not on a team, this will simulate the training environment. Of course, it also has everything you’d expect a good training program to have — a balanced development of strength and the sound principles of periodization. We also provide detailed, photographic, and written descriptions of every exercise in the program, and video demonstrations of all of the SAQ and many of the strength exercises. The movements are basic. The magic is in the program design. Also, the program builds gradually, so Day 1 doesn’t leave you feeling crushed. You’ll actually want to come back and do day 2.
Who is Lightning & Thunder for? Strength and athleticism do not discriminate. 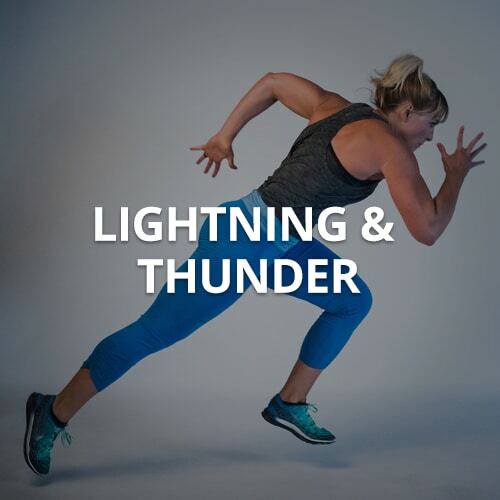 While there are invariably differences in training from person to person, and even between genders in some regards (ACL health being one of them; women are more at risk of tears, which is why we include many drills involved in sound ACL injury-prevention routines), the training principles in Lightning & Thunder apply to everyone. As far as physical results go, your look will very likely change. Some people may call it “getting more ripped” while others might say “toned,” but we’re talking about the same thing: adding muscle, shedding boy fat, and improving posture and coordination. Is the Lightning & Thunder program a good fit for my kid? The short answer is YES! According to the American College of Sports Medicine (ACSM), it's a myth that strength-training is unsafe for children, noting that "the key is to provide qualified supervision, age-specific instruction and a safe training environment." They go on to say, "Generally speaking, if children are ready for participation in organized sports or activities — such as Little League baseball, soccer, or gymnastics — then they are ready for some type of strength training." "The beginner track is perfect for ingraining basic strength-training patterns, and it's never too young to learn how to run and be agile," says program coauthor Tim Moyer. "The younger they learn these skills, the better and faster their nervous systems become, so they are more aware of how to move properly earlier — and thus less prone to injury." Just hold off on heavier loading until puberty; for girls around 11 to 13 and 12 to 14 for boys, says Moyer, adding that kids mature at different rates, so when in doubt, consult with a health-care practitioner. The SAQ portion of Lightning & Thunder, in particular, feels like play, even though it's highly productive. "This program teaches youngsters how to move well — they will be getting quality repetitions," says program coauthor Angie Brambley Moyer, MS, assistant director of strength and conditioning at Princeton University. " It's not just movement, it's movement with purpose." Can I do the workouts at home or, do I need a gym membership for Lightning & Thunder? Here’s the deal: We’d prefer you have access to a full gym for the strength program, because you’ll need access to barbells, dumbbells, kettlebells, a few medicine balls, a sandbag or two, and a Swiss ball. For the SAQ programs, on the other hand you need nothing but a patch of grass or a court and a few cones (a water bottle, shoes, or any other thing you have in your gym bag work in a pinch, too). You can get amazing results either way. Let us know if you’re ever in need of a suggestion — just shoot us an email at support@jensinkler.com. Done, deal, I’m in! How will the program be shipped to me?? Shipping is so ’90s. Both programs are a completely digital, downloadable series PDFs that you get instant access to as soon as you purchase. What’s more, you can download and access the entire system on any device that can read a PDF — which, these days, is nearly anything. You can read it on your computer, your tablet, or even your phone. Or, print it out, if you prefer.